Two years ago in mid-August, the fall semester had just begun at Solano Community and I got pretty busy with Horticulture classes and work projects. I knew the time was nigh to wrap things up on my seven tomato plants. They were starting to look ratty but were still producing and, since temperatures were in the 80's, I continued watering but was not in the yard much and not monitoring for aphids. 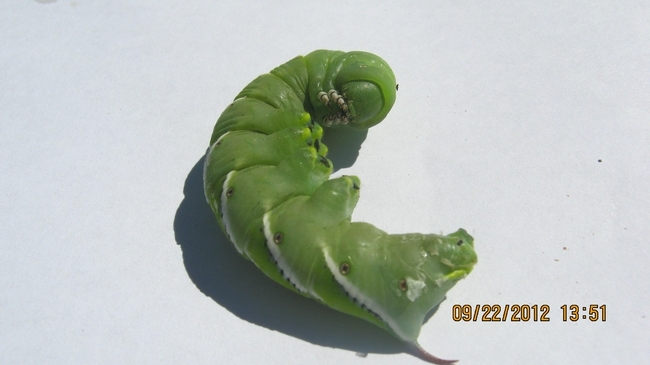 Two weeks later, they were covered with 20-30 hornworms. Wow, what a sight! First time ever. I had no idea I should have been watching for them. My plants did not do well this year (I've heard that from a lot of people), and it seems I was cutting off "dried up" leaves all season. I'm glad I only planted two. The cherry tomatoes were making a comeback in September after cutting them back (see photo). But it was definitely time to pull the other plant that seemed particularly debilitated all season. Well, there they were, two little buggers feasting and, seeing their size (2½") and the "trails" on the tomatoes, they'd been at it awhile. But, then, they don't need much time to gobble things up. I was just glad to see only two. So, take heed. As August develops and September is nigh, as the season wanes and plants weaken, stay on top of things and continue to monitor ALL of your plants for damaging insects. Hornworms drop to the soil and burrow and, although many will not survive, some will emerge again next year. I tried to include specimens, various views and measurements in a single photo, but they squirmed and moved toward one another (for comfort?) as I tried to manipulate them. It’s fascinating to see such creatures close-up. 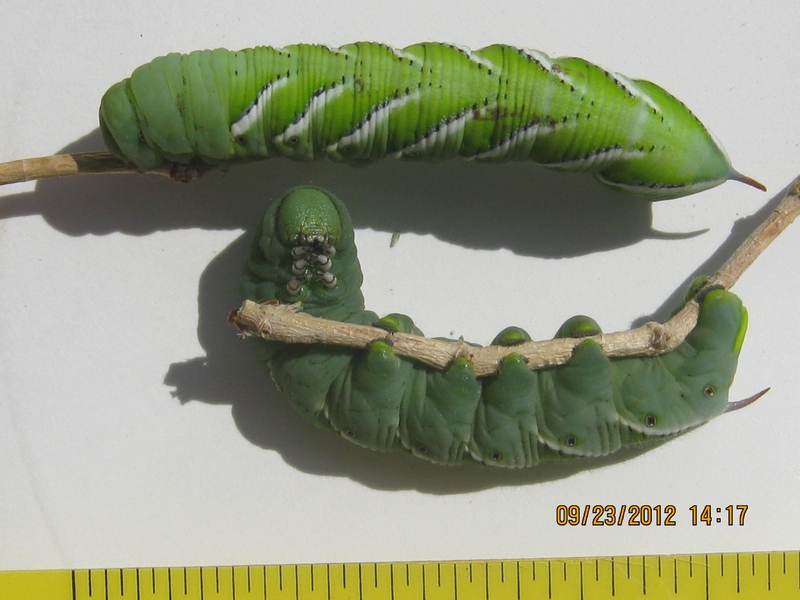 These beasts are Tobacco hornworms (Manduca sexta) , which have 7 diagonal stripes on each side of the body. 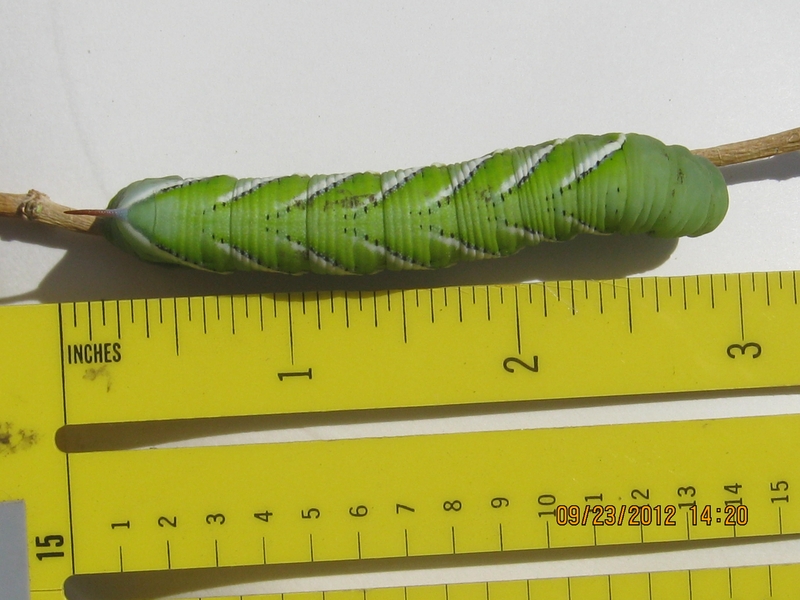 The Tomato hornworm (Manduca quinquemaculata) has 8 chevron-shaped stripes (chevron is a "V" or boomerang-like shape). The face of the tomato hornworm. Impressive size of the tomato hornworm.